The front of the box looks very clear and crisp. 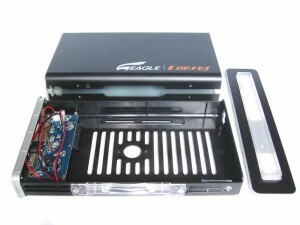 The orange central strip with a white top and bottom giving rise to the logos and features at the bottom; a short blurb on the T-series enclosure is also shown above a few pictures showing off the easy installation and LED base. 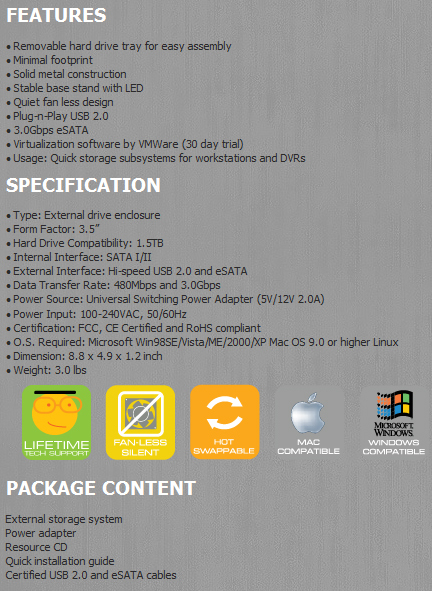 One other very important thing to note here is that the hard drives are not included. The back sees the features of each of the four models available in the T-series range. 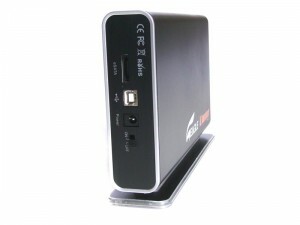 Today, we have the ET-CSTESU2-BK model which is the SATA to USB 2.0 + eSATA edition. The sides see the specifications and a small graph on the different speeds using different connections. 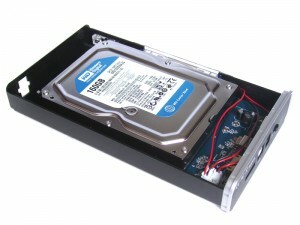 The resource CD does not contain drivers for the enclosure as you may have expected, in fact the enclosure doesn’t require any drivers, and instead it contains some free software such as the Avast Antivirus Protection and a demo for Disk Doctors (you can get a whopping $200 discount coupon!). 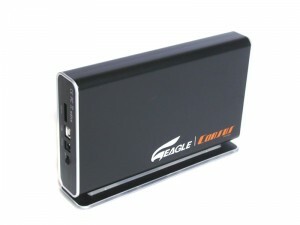 The enclosure is matte black and quite simple in its design. 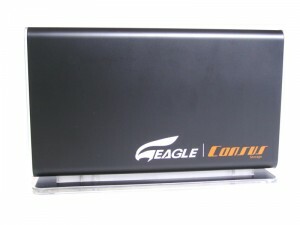 Each side has the silver Eagle logo and, in bright orange, Consus Storage printed next to it. One end has a vent comprised of numerous small holes and another Eagle Tech logo bang in the centre. The other end is brushed aluminium and home to the ports, there are three in total: one for the eSATA cable, one for the USB cable and one for the power cable. 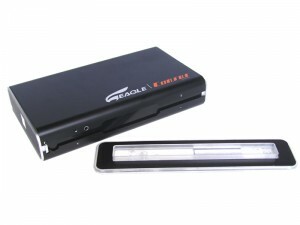 There is also a small on/off switch for powering the drive up (and the LED base). The blue light certainly adds some extra style and brings the product to life. The base is constructed from clear plastic to allow the blue light from the Light Emitting Diodes to be visible. Four rubber feet are attached to add friction and prevent the enclosure from sliding around; finally a couple of stickers display some bar codes and symbols. 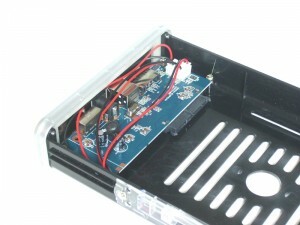 In order to get inside the enclosure, five screws need to be taken out of the base. 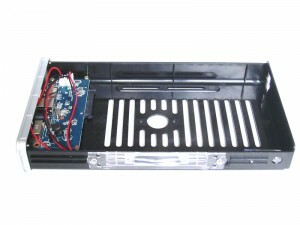 The bay where the hard drive will be contained can then slide out. The bay itself is pretty much empty with just a small blue circuit board at one for the hard drive to clip into. 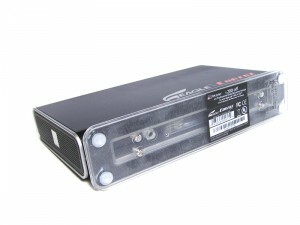 Both the SATA and power connections have been integrated into one connector which the hard drive just pushes on to making installation very simple. There bottom is slatted in order to allow airflow to circulate around the HDD. Finally, we come to the cables themselves which all have black plastic coatings. 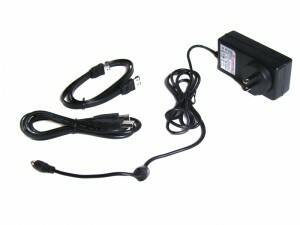 Note that the power supply connection has a US power socket and so can adapter is required for use in Europe. Once the base has been removed, installation is incredibly easy. Just align the hard drive in the bay and then push it on to the connection. Then screw the hard drive in through the base to secure it into position. Then just connect up the power and the cable of choice to the PC and you’re all done. 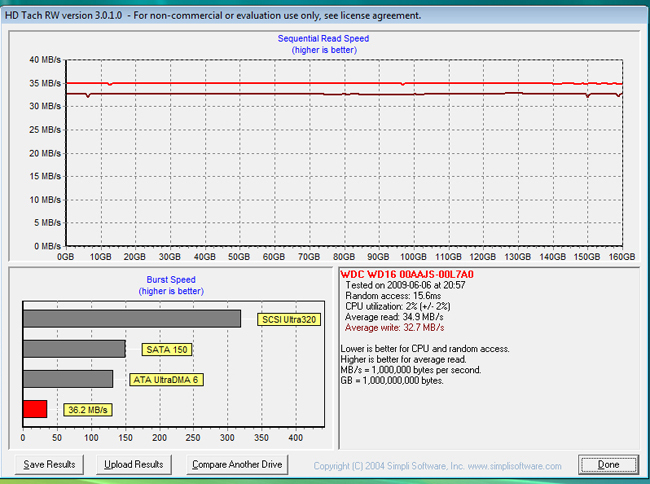 In order to record these values, we used HDTach running the long benchmark. 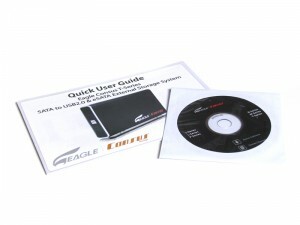 We will be comparing three connection methods; USB, eSATA and straight SATA. For comparison purposes the Vizo Luxon was also tested. 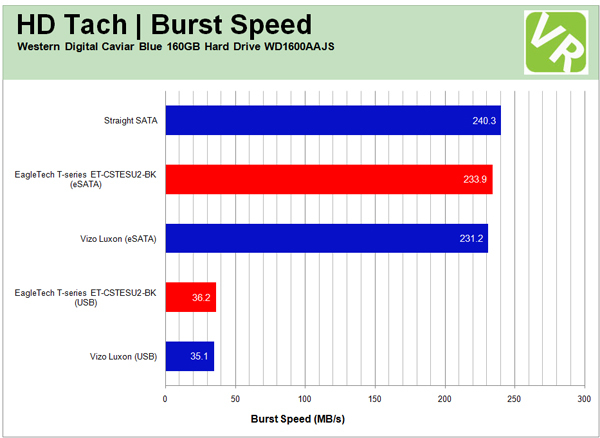 First up let’s take a look at the HDTach graphs; the USB speeds remain pretty constant throughout but there is a slight drop for the eSATA. 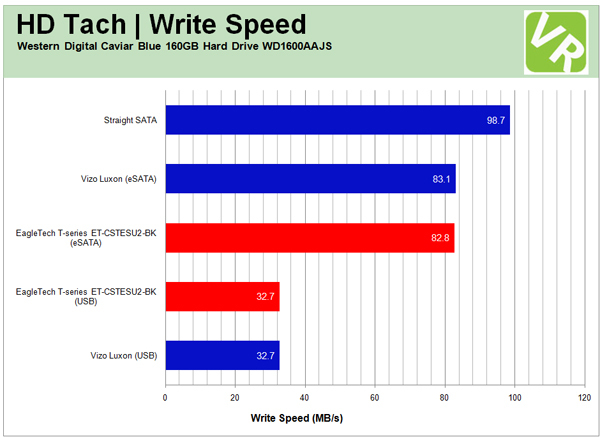 Evidently the results are very close together here and the T-series has a slightly better read speed for the eSATA connection whereas a slightly poorer write speed. 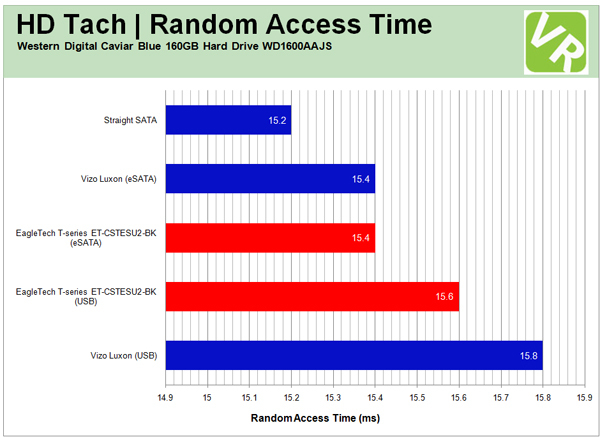 The USB results are vice versa comparatively and are a long way off the performance of the eSATA results. 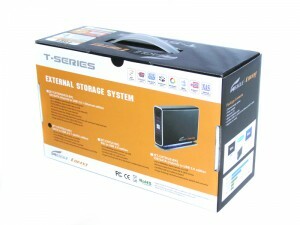 For burst speeds, the T-series is marginally better for both USB and eSATA which is very good indeed. Finally, we come to the final variable which for all the results only differs by 0.6ms. 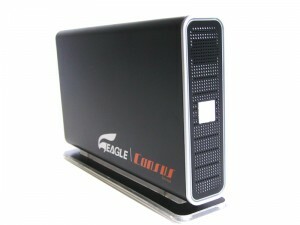 That said, the eSATA readings are identical for both enclosures and the USB for the Eagle Tech product is the victor here over its rival. 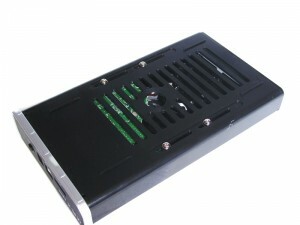 The T-series enclosure is priced at $29 dollars which relates to about £20 – as you can see it’s not a big price tag for a well-performing enclosure. 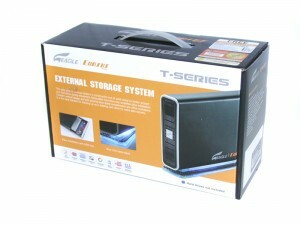 The T-series is a very accomplished enclosure and shows off Eagle Tech’s ability in this market. Both sets of results were very similar to the Vizo Luxon which performed well and so this shows the good performance here. 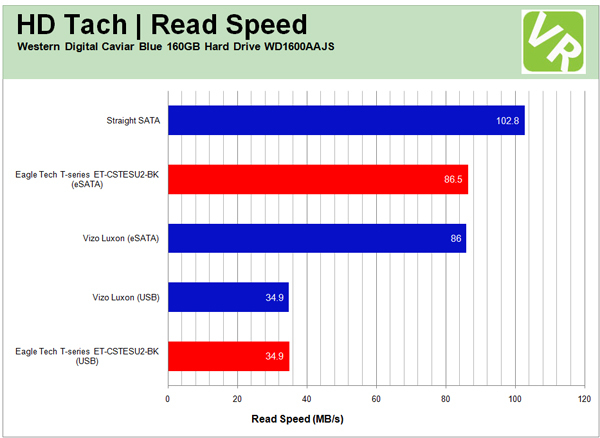 The USB results were still a long way off both the eSATA and straight SATA speeds but they are solid enough. 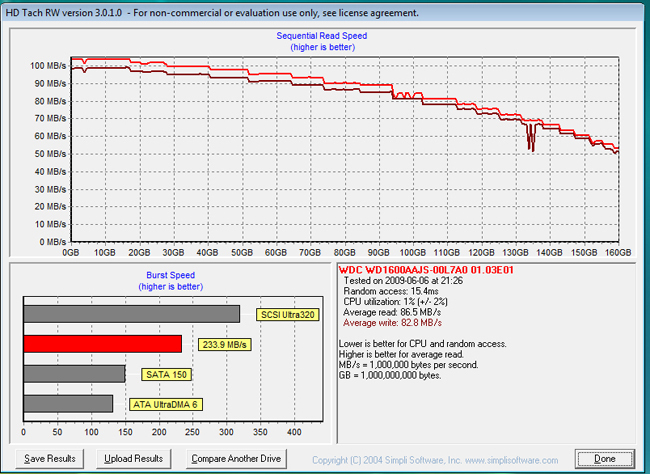 On the other hand, the eSATA speeds are getting very close to straight SATA performance which is very encouraging. 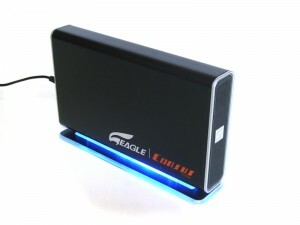 To sum it up, this is a very sleek and attractive enclosure that is well worth a look due to the very solid results for both connection methods – good job Eagle Tech!